This is our brand new health & fitness dumbbell set. It will prove to be a great addition to your home gym. This set of weights will enable you to keep your body fir and strong by enabling you to perform a variety of muscle building exercises. It's designed to develop you leg, hip and back power. With it you could do you gym any time you want. Don't hesitate to buy it! 2. 66 LB Dumbbell Set comes with weight plates set (7.5KG*2PCS, 5KG*2PCS), one detachable tubular rod and 2 buckles. 【Star-Locked Collars for Safe Workout】These four weight plates are installed on the bar with two star-locked collars in order to prevent plates from sliding off during exercise or lifting. 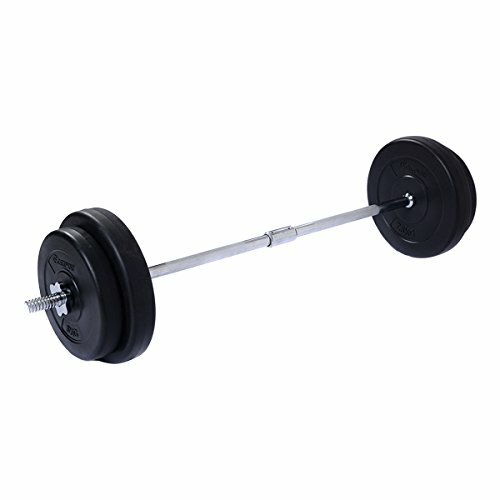 【Rust-Resistant and Easy-To-Hold Bar】- The barbell set is made up of bar, plates with two weight and two star locks. It is crafted of rust-resistant iron which is powerful enough to bear weight of plates. Grains are good for holding and strengthening friction so as to protect your wrists. 【Convenient to Use and Carry】 The barbell with the plates can be used anywhere which is convenient for you to use your spare time to work out in your office or home. It is also easy for you to assemble or disassemble as well as move or transport it. 【Standard Plates with Two Different Weight】The dumbbell set includes 2x7.5 kg(16.5 lbs) plates and 2 x 25 kg(11 lbs) plates, which offers choice for you to change exercise lifting weight based on your own demands. 【Suitable for Both Gym and Home Use】This barbell is suitable for strength exercises to develop your leg, hip & back power as well as make your body fit and in shape. You can use it in gym. And it can also help you save time and money to work out at home.